Isn't it a shame that 1080p has become the de facto standard for PC displays? The 16:9 resolution may favour some forms of multimedia, but it isn't ideal for productivity, where extra vertical space can make all the difference. 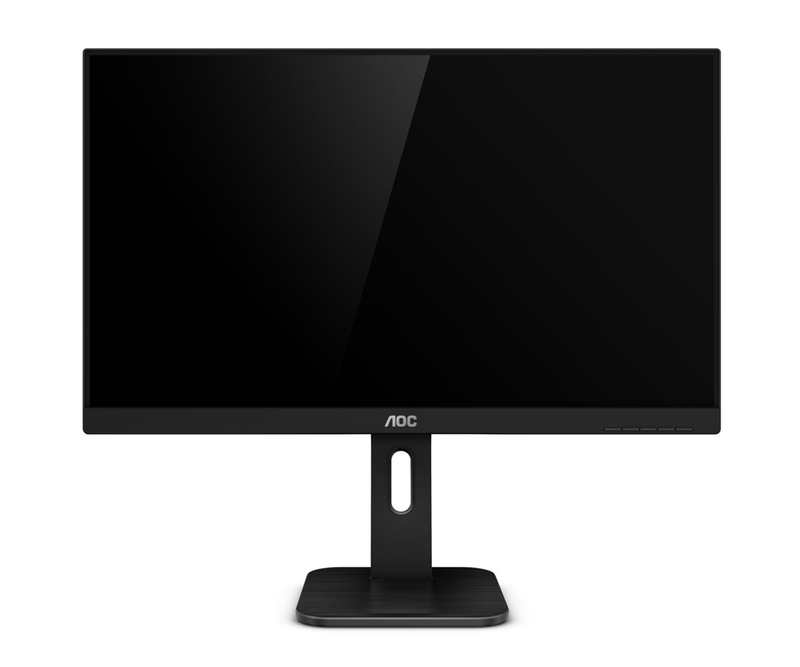 I've spent the past week working with the AOC X24P1, a 24in IPS panel offering a 16:10 WUXGA resolution, and after just a short space of time, I'm left wondering why I made do with 1,920x1,080 for so many years. Aimed primarily at business users, the X24P1 is priced at around £220 inc. VAT and enhances everyday work through a 1,920x1,200 resolution. It doesn't sound like much of a shift - what's an extra 120 vertical pixels between friends? - but in practise the 11 per cent increase in on-screen real estate makes a noticeable difference. There's less scrolling involved when browsing the web, you can see more of your spreadsheets, and the 16:10 aspect ratio makes implicit sense for practically every task other than watching movies. I'd go as far as to say that 3:2 is an even better choice, but good luck finding such an option at this price point. The good news for those who appreciate the benefits of a squarer display is that there are alternatives to 1080p. 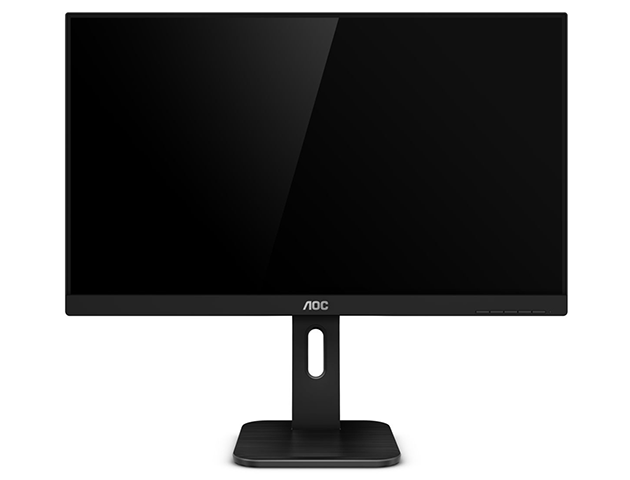 The X24P1 isn't the only PC monitor touting WUXGA goodness - the Acer B246WL, Dell U2415 and iiyama XUB2495WSU all offer similar traits - but AOC's latest has the makings of a very good addition to the office. With business users in mind, the sleek, all-black aesthetic is suitably uncluttered, and though it's a 24in display, the X24P1 shouldn't overpower your desk; the base is suitably compact and a "3-sides frameless" design helps it blend into the environment. The frameless description should of course be taken with a pinch of salt - the display area actually starts at about 7mm from the edge - yet while it isn't exactly borderless, the top and side bezels are nice and thin. 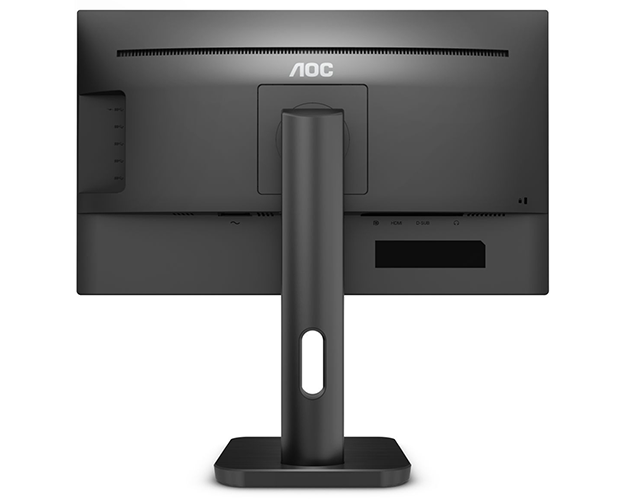 Continuing the keep-it-simple approach, AOC's on-screen-display is quick, well-presented and navigated via a series of four front-facing tactile buttons positioned in the bottom-right corner, alongside the power button. They are much easier to use than finicky touch-sensitive controls, though nitpicking somewhat, we might have preferred a small gap between buttons to help differentiate the power switch from the rest. Putting an emphasis on employee-friendly features is the order of the day. 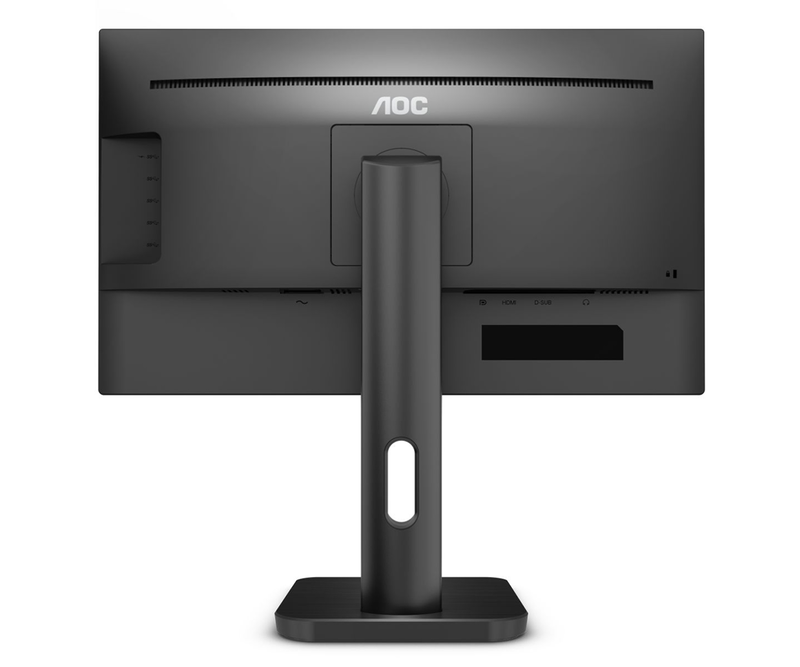 AOC certainly has versatility covered with an easy-to-assemble stand that supports -5°/+35° of tilt, the ability to swivel up to 175°, and an impressive 150mm of height adjustment. Finding a comfortable position shouldn't be a problem, and there's also the option to flip the display into portrait mode. 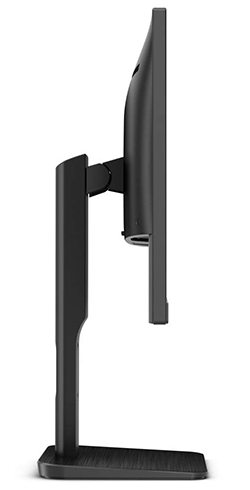 Should you prefer to use a bracket of your own, the stand can be removed to reveal a standard VESA mount. A workplace display should also come well equipped. The X24P1 offers a four-port USB 3.0 hub on its right side, with one of the ports supporting fast charging, and connectivity is varied with users having a choice of HDMI 1.4, DisplayPort 1.2, DVI or VGA. The integrated stereo speakers aren't great but will suffice for basic use, there's a 3.5mm headphone jack should you need it, a built-in PSU omits the need for an external box, and about the only thing that some workers may lament is the absence of a built-in webcam. 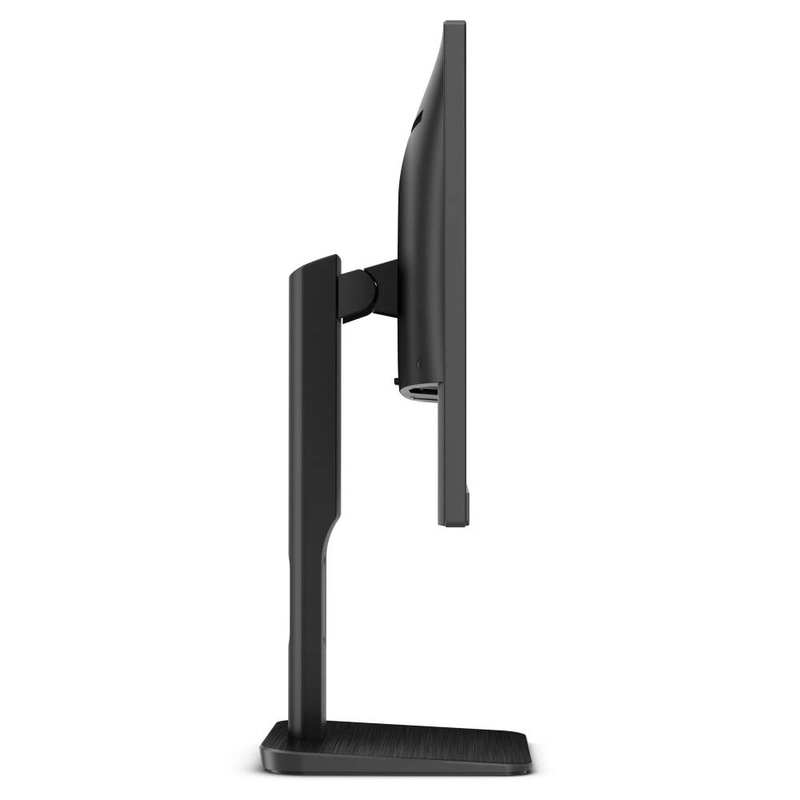 It's important to remember that there tends not to be a one-size-fits-all solution when it comes to PC monitors. Though the X24P1 is aimed primarily at businesses, the 24in panel isn't an ideal choice for content creators as it lacks ultra-wide colour coverage and the perfect uniformity required for precision work. Similarly, the 4ms response time isn't ideal for gaming, and there's no support for adaptive framerate synchronisation. 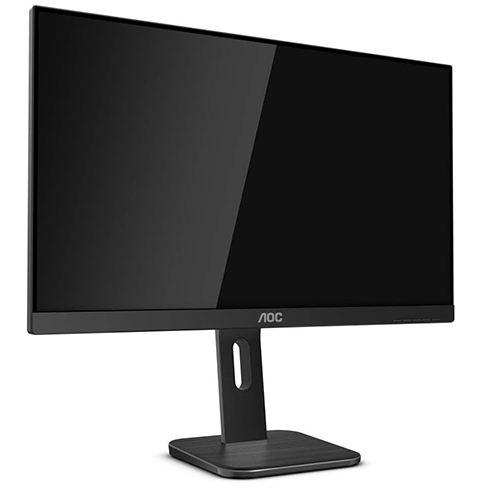 No surprises there, however what you do get is a highly competent IPS panel that exhibits impressive brightness, a standard 60Hz refresh rate, good out-the-box accuracy, and wide viewing angles that make it easy to collaborate with colleagues. Colours don't wash out drastically even when viewed from the side, there's little need for further calibration, and if you do insist on a quick game of Counter-Strike on your lunch break, a choice of overdrive settings help alleviate signs of ghosting. The highlight is of course the 1,920x1,200 WUXGA resolution, yet while we're admittedly fond of a 16:10 aspect ratio, there are a few potential provisos to consider. At this size, 94 pixels per inch might be considered basic by today's standards, and on-screen content (text in particular) may appear less sharp if you've become accustomed to an ultra-high-res panel. 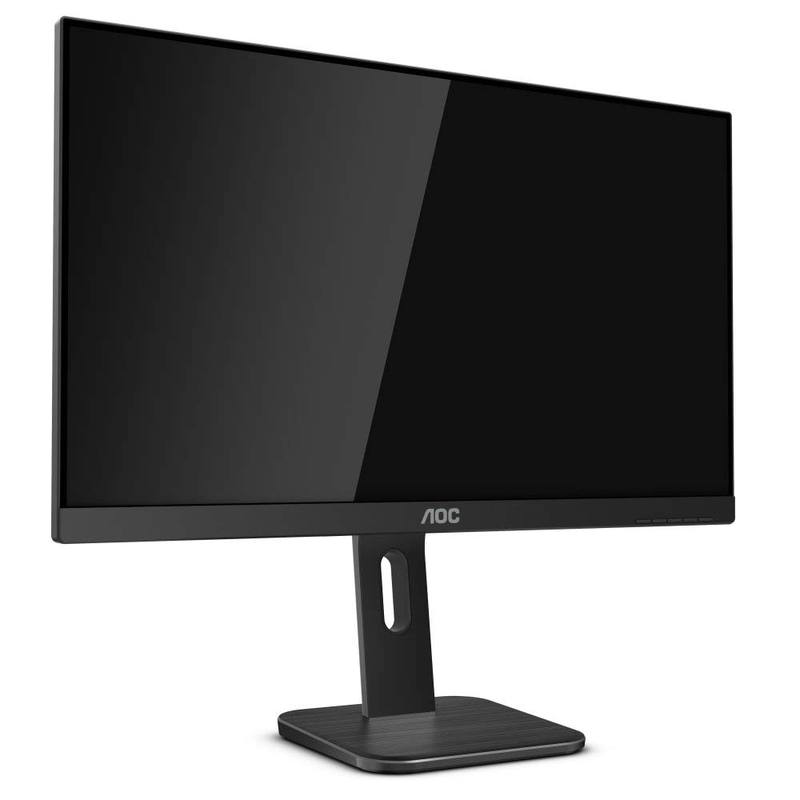 There's also a small matter of software support - many websites and apps are optimised for a 1080p resolution - but at the £220 price point these are minor niggles on what's shaping up to be an excellent workplace display. Let's see if the benchmarks agree.